Remember your first crush? How your heart raced and your cheeks flushed whenever you saw him? Jessie Baxter does, and itâs happening again. Ten years ago, despite her best efforts, Lee Archer wanted to be just friends. Now, he wants more, but Jessie's still recovering from a psycho ex-husband. 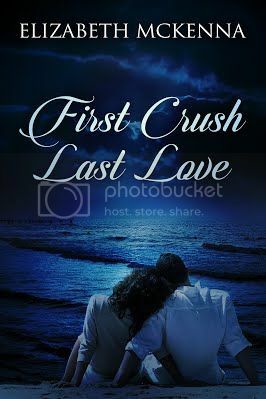 Can she learn to trust again and make her first crush into her last love? Elizabeth McKennaâs latest novel will have you remembering the angst of high school, the grief of a failed relationship, and the happiness of true love. When her stomach rumbled in appreciation of the smoky sweet smell, she sat up with a jolt. Lee Archer was in her motherâs kitchen making breakfast, and it smelled damn good. She jumped out of bed and twirled in a circle, unable to decide what to fix first. Her frizzy curls stood out in every direction, and her breath reeked from last nightâs garlic-laced meal. In the kitchen, Lee stood at the stove pushing eggs around a pan and wearing last nightâs rumpled clothes and a shadow of a beard. Jessie clamped down on her bottom lip. It was too much to take in. âYouâre awake. I left you some coffee.â He gave her a crooked smile before turning his attention to the frying bacon. âBreakfast will be ready in a minute. Can you put down the toast?â He nodded with his chin at the toaster. While she slept in, Lee had set the table, cooked eggs and bacon, poured juice, and cut three mums from her motherâs garden for a centerpiece. Yeah, making toast was the least she could do. Leeâs eyes ran up and down her body, and then something akin to a growl came from his throat. Maybe she should have put on sweats instead of shorts. âIs it OK?â He pointed at her plate with his fork. Putting her fears into words would make them too real, but from the grim look on Leeâs face, she didnât have to. âYou could file for a restraining order,â he said. âWould that help?â She wasnât sure she had the strength for more legal action against Billy. Like most divorces, theirs had been ugly, full of half-truths and name-calling. She had even secretly wished him dead at one point to put an end to it all. Stalking her. She hadnât thought of it like that, but it was what Billy was doing. Her knuckles whitened as she gripped her fork. Three years. Before this weekend, it had been three years since she had talked to her ex-husband. Why couldnât he move on? If their love had been so wonderfulâif they had been soulmatesâhe never would have cheated on her. That was the one thing she had never understood when he fought the divorce. It was obvious they werenât right for each other. Why couldnât he see that? âHow about I clean up while you shower?â Lee gathered their dishes and headed for the sink. âWell, the cockiness might be a turnoff,â she said, covering her desire for him with a dose of sass.